geoSCOUT Version 8.7 includes New Data Analytics Module - geoLOGIC systems ltd.
geoLOGIC systems ltd. is pleased to announce geoSCOUT Version 8.7, available May 24, 2018. This exciting new release includes a new Data Analytics module, Ownership Analysis upgrades, Proprietary Production integration and new Frac Focus data. We’ve implemented 56 customer enhancements with upgrades to over 20 modules. geoSCOUT delivers optimized technical workflows and business intelligence analytics within a single, fully-integrated platform. With over 30 modules for all disciplines, geoSCOUT delivers 6x efficiency and helps you make better, more informed business decisions. See the geoSCOUT video. • To access the newest geoSCOUT release contact your System Administrator. • To subscribe to additional modules, or if you are new to geoSCOUT, contact our sales team at sales@geologic.com or call 403-262-1992. Use geoSCOUT in a whole new way! 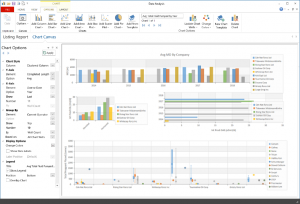 Visualize your data with listing reports and charts. Monitor areas, identify trends and discover opportunities. Combine and integrate numerous datasets in a single interface – wells, production, frac and more. • Get the complete ownership picture with undeveloped land holdings summarized by company. Search, model, analyze and map your production metrics right away rather than waiting for the public data release. Frac focus data now included with Frac Analysis module – Get additional fluid frac data. New barrel of oil equivalent (BOE) and lateral length calculations – Improve your metrics with additional normatlization and comparative options. Expanded data table manipulation capabilities – Drag, drop, sort, group and rearrange with data with increased ease.